Born in Modena, steeped in what Ducati means to Italy and an integral part of the Bologna factory since 1995, it is fair to say Ernesto Marinelli cares about taking the Italian marque back to the top table of World Superbike. When Chaz Davies hurtled around Motorland Aragon ahead of everyone else in race two earlier this year, the Welshman enforced Marinelli’s view that Ducati is back, and they will continue to do everything they can to challenge the mighty dominance of the Kawasakis in recent seasons. Ducati came into 2015 full of optimism that the new Panigale R would give them a platform to challenge the likes of Jonathan Rea and Tom Sykes and so far it has proved that and re-inforced it with the double win at Laguna. “For now, the path of the homology has been going quite in-line with last year as well, say on the chassis side because there was basically no changes in regards to the regulations so that just kept going on its natural way,” he told Bikesport News. “We take this and try following on the feedback of the rider and trying to improve the bike overall, because there was no one specific area that the riders were complaining about. “If I had to choose a specific area where I think we can improve, I would probably say is the pure rev, getting out of a slow corner, there is a complaint that is coming up there. This year the bike was different completely on electronics because of the new regulations, so we have had to redesign and reengineer all the electronics again. Fortunately we were able to bring all the main software that we were using last year with ECU that we’re using this year and that I think on the electronic side was a very good compromise keeping the costs very down but in the end not losing so much on the performance. For Marinelli, his first foray into championship racing was in 1997, before he headed off to America as project manager of Ducati’s AMA team for a couple of seasons, but it was in 2001 when the affable engineer showed his real potential as part of Ben Bostrom’s L&M Ducati team in World Superbikes. Bostrom’s six-race haul of victories was down in no small part to Marinelli’s dexterities and in 2003 the Modena man was upgraded to technical director of the overall Superbike project, before becoming Ducati’s World Superbike Project Director in 2010. Amazingly, Davies’ victory back in April was the first time a full factory Ducati Superbike had won a race in the category since Noriyuki Haga’s success at the Nurburgring way back in 2010. The 28-year-old was a rider Marinelli sought after impressive performances in World Superbikes while Davide Giugliano had ridden in Ducati privateer teams in the past. The project director feels the dynamic between the two riders is one of Aruba.it Ducati’s biggest strengths this season, as both men are very different on and off track but are in turn, stimulating to work with. “The setup of the bike is quite similar between the two riders, even if they have two riding styles that are slightly different,” began Marinelli. “Davide is really sensitive on the side grip because his strength is the corner speed, so of course because he’s doing most of his lap time carrying a lot of corner speed, when the grip goes down he’s chasing the bike a bit more. Other riders can have a bit of a stop and go kind of style, like Tom Sykes for example, so on Davide’s side we try to work out the two, keep the edge grip even when the tyre condition is not the best. In essence, the Ducati World Superbike team are on more than a road to recovery following recent barren years, they’re on a road to success and challenging consistently for race wins is becoming a reality. 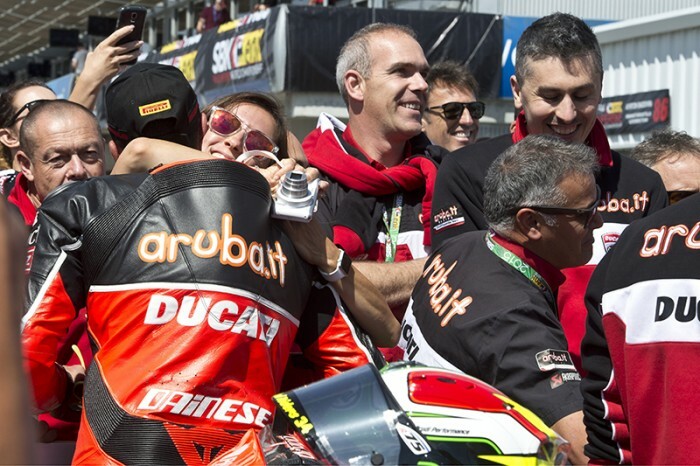 While Kawasaki still have the edge at the front, Ducati, in all their effort and enthusiasm at Borgo Panigale, are getting closer and closer to destabilising the Kawasaki monopoly this season and Marinelli believes hard work is the only way forward. “Well, of course, you know, we are working full speed all the time,” he explained. “The development process never stops. Of course, it depends, you have a certain potential of fire on the designing new parts, producing new parts, testing it and make it rideable so this is something that is taking a bit of time. “As I said the work is always constant, we go forwards, there is always new ideas and new things that we are designing and then you simulate. If it’s good, you go to analyse it and test it on the track and on the dyno, you get the feedback.